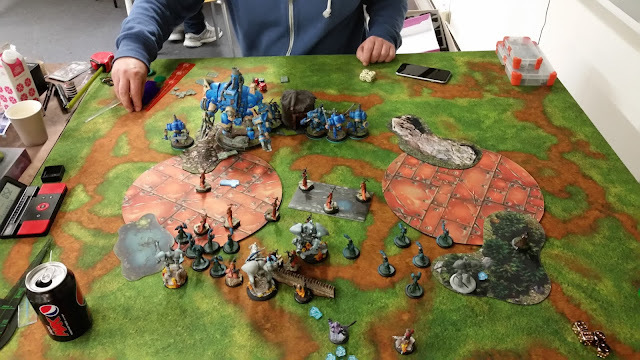 A Warmachine & Hords blogg . After the previous game, I feel like I have a personal vendetta against Cain. And I wanted to win this game, with a burning desire. 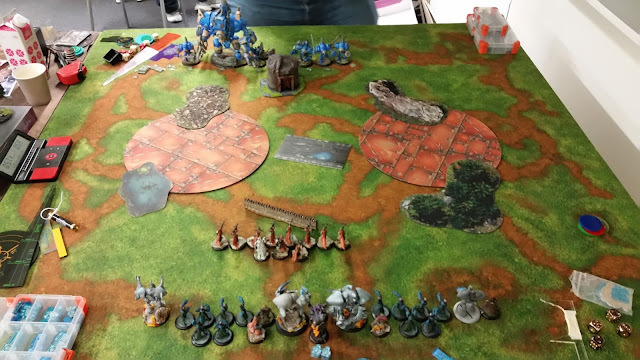 So I persuaded my previous opponent to set up his models again. To my joy, my opponent opted to play Cain again. Pay back time! And as always, Rahn is underestimated. But more on that later....! I know for a fact that Cain with shoot can gun my army down, if I let him. So gunning for scenario, or attrition is out of the question. Its assassination time! We were playing the scenario, Outlast. Rahn wins the roll, and wants to go first. I'm a bit unsure on how to play this game. My opponent has alot of jacks, and an colossal. I would rather try the scenario game, but I dont know if I can handle a colossal. My damage output on units, or a caster is okay, but killing a non placeable colossal is going to be hard, especially with +2 arm. So I decided that if this game is going to be won, I have to go for an assassination. The lack of units on my opponent's side, makes me feel safe. He doesn't have a volume of attacks that can take out my battle mages. Nor are my jacks in any danger, since they cant be draged past my stealth infantry. Of course Orin demands his normal attention. Making my mages, and caster worthless while assassinating. But for now, I feel safe, and run up with most of my stuff. Rahn hands out two focus to bouth Chimeras, one standing in the forest. The second out in he open, but out of range for any harm. I run my Discordia up, and imprint. He's going for Orin next turn! 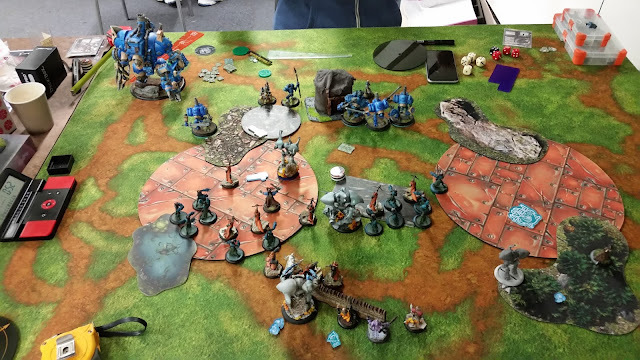 My opponent moves up, a bit new to Rahn, he placed his caster in range, but well safe since Orin is within range of him. Orin is a superb model, and I would love to have him in Retribution. Cancelling spells within a certain range is great. But the trick against Rahn is to keep him close to your caster, at all times. And whatever that is in front of your caster. My opponent made a small error in judgement, not a big one. But still big enough for me to catch Orin with Discordia spray. Orin is always a problem, and keeps my plans at check. Falling deep into the tank for a few minutes. Trying to avoid a long game, I figure that I have to roll 7 on 3d6 and 4 on 3d6 to get rid of Orin. If I get rid of Orin, his caster will be standing with his back towards me, knocked down. And in range of my mages. It's a sure thing. I move my Discordia, roll the die. Kill Orin. Place the closest Chimera in range, telekinesis the Tallon behind his caster. Forshammer, and a telekinesis later. His caster is in the open. The rest is gravy! I'm really starting to warm up to this list. Rahn keeps amazing me, on all the assassination angles. And how much damage hi can push out with a spell, when used in the correct order. And his mages.... wow these guys are good under his feat turn. The texts, details my competitive Ret journey in Warmachine & Hordes. The faction tags below link to battle reports with every represented faction.